Please follow this link to the Operation and Safety Instructions for the Brush Chipper. Know the capacity and operation characteristics of the forklift. Never modify or remove any part of the lift. Buckle-up your seat belt before you start up. Keep others away from your operation. Carry load low at a minimum clearance. Know the danger and warning signs on your machine. Before you start the workday, take time to check your machine and have all systems in good operational condition. Check the surface over which you will travel. Look for weak spots on docks, ramps, floors. Look for holes, dropoffs, obstacles. Check the clearances of doorways, canopies and overheads. Never approach power lines with any part of the machine. Adjust the seat, fasten the seat belt, set the parking brake and put the controls in neutral before starting up. START THE ENGINE FROM THE OPERATOR'S SEAT ONLY!!! and backup bell. Make sure that all controls are functioning properly. Don't use the machine if it doesn't respond correctly or there is something wrong with it. When starting the unit in an enclosed area, make sure that there is enough ventilation. Know the rated load capacity of your forklift and never exceed it. REFER TO THE MACHINE'S LOAD CHART (if unit has one installed) BEFORE PICKING UP THE LOAD. Operating conditions (uneven, unpaved, inclined surfaces) can reduce the amount you can lift. Inspect the load to be moved. If it appears unstable, DON'T MOVE IT! WARNING: An unbalanced forklift could tip over and cause injury or death. Operate the controls smoothly; don't jerk the steering wheel or lift controls. Avoid sudden stops, starts, turns or changes in direction. NEVER "cowboy" or play games with a forklift. NEVER attempt to work the controls except from the operator's seat. NEVER leave the operator's seat without first lowering the forks to the ground, setting the parking brake and placing the controls into neutral. WARNING: Keep all parts of your body inside the operator's compartment while operating the forklift. Don't touch, lean on or reach through the mast, boom or lift mechanism or permit others to do so. WARNING: Your forklift is a ONE-PERSON MACHINE. NEVER PERMIT RIDERS!! WARNING: Never lift the load over anyone. Keep others away from your operation. NEVER drive a forklift up to someone standing in front of a fixed object. WARNING: ALWAYS CARRY THE LOAD LOW FOR MAXIMUM STABILITY. When you travel with a load, keep the forks tilted back and the load as close to the ground as possible. Be cautious when carrying drums, cylinders, reels or other round objects. Keep forks tilted back or use a tether or tiedown, if necessary. IT IS YOUR RESPONSIBILITY TO EVALUATE WORKING CONDITIONS AND ADJUST YOUR OPERATION ACCORDINGLY! Downshift with great care. Sudden deceleration could topple the load. Come to a complete stop before reversing direction. Be alert when operating near the edge of a loading dock, ditch, embankment, etc. Check the overhead clearance. WARNING: Travel on inclines, slopes, ramps as follows: LOADED ... with forks pointed uphill. UNLOADED ... with forks pointed downhill. NEVER depress the clutch when going downhill and NEVER coast in neutral. ALWAYS use a signal person if you can't see the placement point. CAUTION: Use extreme caution when placing loads near overhead power lines, water pipes, sprinklers, steam pipe, walkways or other potential hazards. CAUTION: The pressure locking brake is for temporary stops and MUST NOT be used as a parking brake. Come to a complete stop, set parking brake and lower forks to the ground. Place controls in neutral, idle engine for gradual cooling and shut off engine. Cycle hydraulic controls to eliminate pressure. Remove ignition key, lock anti-vandalism covers. Dismount, block wheels if on a slope or incline. If unit is LPG OPERATED, be sure that the propane tank is shut off when parking. Failure to follow warnings or instructions can cause serious injury or death. The Operation and Maintenance Manual, Operator's Handbook, safety manual and machine signs (decals) provide proper operation and maintenance instructions. Study these documents and decals before operating your mini-excavator. Know your machine! Always check the service schedule included on the machine. Your rented mini-excavator has gone through a thorough "Rental-Ready" maintenance procedure, but you should always double check fluid levels before operating your machine. Unless you have made specific arrangements with your local rental company, NEVER perform maintenance on a rented machine. Call your rental dealer with any maintenance questions. Check for leaks, broken or damaged parts before operating. Always fasten seat belt snugly for restraint and lower the control console. Know the location and function of all safety features and interlocks, gauges and operating controls. Activate the auxiliary hydraulics pedal for hydraulic attachment operation. Wear proper clothing and use personal protection equipment as required for the job. Service and repair work should be done only by qualified service personnel. Call local utilities before you dig: 1-888-258-0808 (National Referral No.) or see: U.S. & Canada Underground Utility Locater Numbers for your state or provincial number. Know the location of underground gas, water and electrical lines. 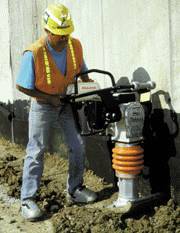 Inspect work area for holes, drop-offs or unstable ground. Know the weight limitations of operating surfaces and clearances. Make sure attachment is securely fastened to excavator. The attachment signs (decals) and Operator's Handbook provide operating and maintenance instructions. Failure to follow warnings and instructions can cause serious injury or death. Use only approved attachments for the compact excavator. Start excavator with steering levers and hydraulic controls in neutral. Keep bystanders away. Move steering levers and pedals smoothly. If your mini-excavator has a hydrostatic drive, be aware. Hydrostatic drive systems are responsive. Excavator will move immediately when controls are activated. Check blade location before moving travel control levers or pedals. Excavator will move in the direction of the blade when steering levers are moved away from the operator. Keep your attachment low when traveling. Do not exceed the rated lift capacity. Read and understand the load rating chart on the excavator. Keep bystanders away from the maximum swing area. Never lift a load over another bystander. Always look in the direction of travel before moving the excavator or rotating the house swing (slew). Keep bystanders away from the work area. Do not swing loads on a slope. Swing loads low and slowly. Do not travel across slopes which are more than 15 degrees to the side or to the back of the machine, or 25 degrees to the front. Keep boom centered. Keep hands and feet on controls or footrests. Never operate excavator's controls from the ground. Always sit in the operator's seat when activating the controls. Lower the attachment to the ground. Remove the key to prevent unauthorized starting. Use the grab-handles, track and skid-resistant surfaces when getting on or off the excavator. Do not jump off the excavator. Always drive up the ramp with heavy end uphill (boom, dipper, etc.). Engage swing lock and secure excavator and attachments using tie-downs and chains. Use towing vehicle and trailer of adequate capacity. NEVER PUT FINGERS NEAR SPRAY TIP NOR AIM GUN TOWARD ANY PART OF THE HUMAN BODY. NEVER OPERATE THE SPRAYER WITHOUT THE TIP GUARD COMPLETE AND IN PLACE. NEVER SPRAY IN THE VICINITY OF OPEN FLAME, PILOT LIGHTS, ELECTRICAL OUTLETS, OR ANY OTHER SOURCE OF IGNITION. NEVER SPRAY VOLATILE MATERIALS WITH FLASH POINTS LOWER THAN 140° F 60° C). NEVER WASH AN ELECTRIC MOTOR DRIVEN UNIT, NOR OPERATE IT IN THE RAIN OR DAMP AREAS. NEVER LEAVE THE UNIT UNATTENDED WITHOUT FIRST SHUTTING OFF, TRIGGERING THE GUN TO RELIEVE ALL PRESSURE AND SETTING TRIGGER LOCK ON THE GUN IN THE "LOCKED" POSITION. ALWAYS FOLLOW ALL SAFETY PRECAUTIONS AND OPERATING INSTRUCTIONS COMPLETELY. ALWAYS ENSURE THAT THE MOTOR SWITCH IS IN THE "OFF" POSITION BEFORE PLUGGING IN ELECTRIC UNITS. ALWAYS CHECK CONNECTIONS AND FITTINGS FOR TIGHTNESS BEFORE OPERATING THE UNIT. ALWAYS WEAR A FACE FILTER MASK AND SAFETY GLASSES WHEN OPERATING THE UNIT. ALWAYS OBSERVE GOOD HOUSEKEEPING AND KEEP THE SPRAY AREA FREE FROM OBSTRUCTIONS. ALWAYS BE AWARE THAT CERTAIN CHEMICALS MAY REACT WITH ALUMINUM, CARBIDE, OR OTHER COMPONENTS IN THE PUMP SYSTEM. DON'T TAKE CHANCES! READ THE Airless Sprayer Operating & Safety Instructions. IF IN DOUBT, CONSULT YOUR RENTAL DEALER TO BE SURE. Never Treat Any Injection Injury as a Simple Cut. If Injury Occurs, Obtain Immediate Attention. Be Prepared to Inform the Doctor What Fluid Was Injected. I Have Read the Above Instructions and Agree That They Will Be Followed carefully. I Also, Agree That The Equipment Will be Used at My Own Risk and Agree to Indemnify All Claims for Damages and Liabilities Resulting From Its Use. Check the area for the location of underground cables, water and gas lines.If unsure, check with your local rental center to obtain your local underground alert contact information. They can usually give the locations ofcables etc.NOTE: Sometimes two working days are required before they may be able to give exact locations. Check the clearance of overhead power and telephone lines. Inspect any new work area for hidden holes, drop-offs or obstacles that could be dangerous. Always use the hand rail and steps when mounting your machine. Never mountunit unless the arms are lowered or restrained. Never use the control levers as hand holds when climbing on or off. Always fasten your seat belt and adjust the seat for the most comfortable position. Controls should be in neutral or park position and parking brake SET before starting. Start the engine from the operators seat only. TURN THE KEY COUNTERCLOCKWISE AND HOLD FOR 20 SECONDS (this will preheat the glowplugs, and allow for easier starts) THEN TURN THE KEY CLOCKWISE TO START THE UNIT. Warn people in the area that you are starting up. Once the unit is started, allow the engine to warmup for 30 seconds before moving. Run through a complete check of all equipment controls.If the "feel" of the levers or response of attachments is unsatisfactory, don't operate the machine. Move slowly until you are certain everything is operating properly.BE SAFE NOT SORRY!! Check all lighting systems and safety devices (if provided) such as headlights,horn, wheel lugs tight, etc., to be sure that they are functioning properly. This is a one person machine, NO RIDERS ALLOWED!! NEVER SPEED!! Operate at a ground speed consistant with working conditions and terrain. Avoid crossing exposed railroad tracks, ditches, ridges or curbs if possible. If crossing cannot be avoided, reduce speed and cross at an angle. NEVER allow un-qualified people to operate your machine. Handled improperly, this machine could cause severe injury or fatality. NEVER move or swing loads above the heads of other workmen. Avoid slopes with steep or unstable surfaces, do not drive across slopes. 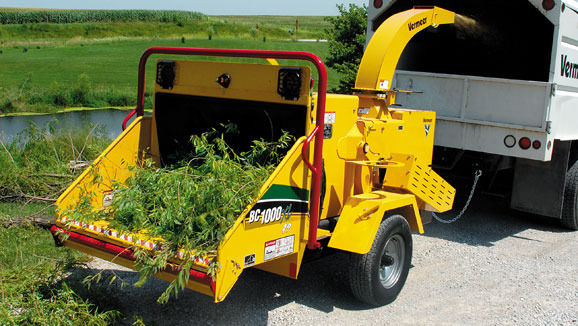 Go directly up and down a slope or ramp with the heavy end of the machine uphill. When operating the loader, ALWAYS carry the bucket low for maximum visibilityand stability. Be sure your vision isn't obstructed when traveling or working. Never attempt to make sharp turns or travel on steep slopes with a raised load. Extreme caution is required when back filling, as the weight of the loader could cause new construction to fail. When under-cutting high banks, watch for dangers such as falling rocks, overhanging trees or a cave-in. Place the controls in neutral or the park position. ALWAYS lower the bucket to the ground. Idle the engine for gradual cooling, (30 seconds) then stop engine. Remove the key to prevent unauthorized starting and movement. 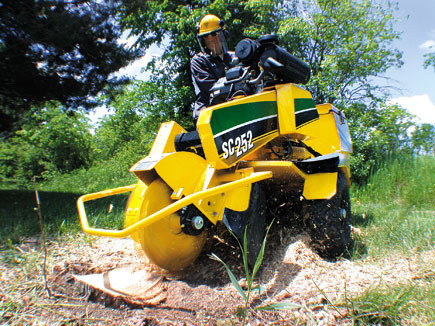 Compactors are a mainstay of nearly every general tool and construction equipment rental dealer. From smaller, stand-behind rammers and plate compactors to larger, ride-on equipment, compaction equipment provides both homeowners and contractors with a wide variety of equipment from which to choose. Choosing the right compactor depends on the job and the soil conditions in your area. Multiquip, one of the rental industry's leading provider of tools and equipment has prepared an informative Soil Compaction Handbook to make it easier for homeowners and contractors to get the most of their compactor rental. Clicking on any of the above links will open a new browser window and direct you to independently managed World Wide Web Sites which are not affiliated with this rental store. While every effort has been made to evaluate the sites to which we link, we cannot control the content that may appear on these or related links. Please follow this link for Safety and Operating procedures. Trailer towing has the dubious distinction of being the number one loss-liability incident in the equipment rental industry. It has occupied that position practically since the first equipment rental dealers rented the first trailer. Although some equipment rental dealers have decided that the risks of trailer renting are not worth the benefits, the rental industry still offers consumers and contractors a long list of trailers from which to choose. In most markets, consumers and contractors can depend on their local rental store to provide a wide array of utility and light-equipment trailers that can meet almost every need. When you rent a trailer, it makes sense to take time to acquaint yourself with basic safety guidelines, specific to trailers. Most accident involving trailers are the result of carelessness and the failure of the driver to observe basic safety rules. Trailer towing is safe when precautions are taken. Know the towing laws in your state. Follow the link at the end of this article for state-by-state listing of applicable towing laws. Use a towing vehicle prepared and capable of handling the load. Towing and trailer requires special awareness because of the changed driving situation – be alert. When towing, it takes longer to start, stop and pass – use training and practice to avoid accidents. Turning and backing up present new problems – plan ahead. Require each driver to be fully trained and experienced in trailer towing before going out on the road. Be sure trailer is fully prepared and properly connected to towing vehicle. Observe maximum towing speed limits when towing. Do not modify or change your rented trailer in any way. Adjust load on trailer so tongue weight is approximately 10 percent of the gross trailer weight and center load side-to-side to reduce fishtailing. Tighten all parts, bolts, nuts and mounting hardware. Proper loading is essential to safe towing. OVERLOADING can cause serious injury or equipment damage. DO NOT OVERLOAD your rented trailer. Do not overload the trailer. The Gross Vehicle Weight Rating (GVWR) is the maximum total trailer weight with the engine driven welding generator and all equipment such as tools, cables and shielding gas cylinder installed. The Gross Axle Weight Rating (GAWR) is the maximum load-bearing capacity of the trailer’s axles. GVWR and GAWR information can be found on your rented trailer’s frame, usually near the front of the trailer. Locate these ratings and familiarize yourself with the ratings. DO NOT exceed your rented trailer’s ratings. Weigh your trailer after you have loaded it. Adjust weight by removing accessory equipment if necessary. Call your local authorities to learn the location of the nearest scale location. Use gross trailer weight to select a proper towing vehicle. Distribute weight to that trailer tongue is approximately 10 percent of gross trailer weight. Tongue weight is the amount of trailer weight that rests on the towing vehicle – that is, the downward pressure on the coupler. Remove or adjust trailer load to get correct tongue weight. Do not let tongue weight exceed coupler and hitch rating. Use slower speeds when towing a trailer to prevent fishtailing. Know your state’s trailer towing speed limits. CAUTION: When trenching in areas filled with obstructions, such as rock and debris, operate the trencher at less than full throttle to ensure a quicker clutch release and prevent damage to the machine and possible injury to you or bystanders. CAUTION: This tool is intended to dig in soils only. It is not intended to be used for cutting through rock, concrete, asphalt, wood, metal or any other material that is not of a soil type. Attempting to do so may result in damage to the machine or injury to the operator or bystanders. CAUTION: Stop engine and remove sparkplug wire before attempting to clear any jams in the digging chain, side delivery auger, clutch or drive belt and primary chain drive. Remove sparkplug wire before performing any maintenance on machine. CAUTION: Before operating trencher, BE SURE IT IS STRUCTURALLY AND MECHANICALLY SAFE. Check all engine controls, clutch action, belt and chain condition and wheel ratchets. Be sure that the protective guards are in place. If the trencher is not working properly or is not structurally safe, take the necessary steps to put it in working order before putting it in operation. Keep bystanders away from the trench and trencher while it is in use. Remember, trenchers are useful tools, but they can be hazardous both to the operator and bystanders. Before using trencher, clean work area of debris, such as rocks, wire, boards and any other potential hazards. Inspect the entire work area for unexpected buried hazards, such as boulders, foundations and fencing. Make sure you know the location of all buried utility lines. The utility companies will locate and mark the lines for you. WARNING: A cut electrical cable or gas line can result in injury or fatality. Always stop the motor when you leave the operator's position of the trencher or if somebody approaches the trencher at the "working end." ear protection, helmet, boots, gloves and dust masks are some items that may be required. CAUTION: Never wear a watch, ring or necktie when working with machinery. Keep your hands, loose clothing and your hair away from moving parts. Use extreme caution while operating trencher on uneven terrain. Do not risk tipping or rollover. Try to use trencher in a level position. Make sure you know the stability of the trencher. Natural vibration will make the trencher creep sideways down a slope. While digging, if the trencher hits anything, jams or begins to labor, turn the motor off and inspect the trench and trencher for any possible causes. Always start trenching a safe distance from any object, such as a fence or foundation. The digging teeth could possibly catch and climb the object. Never operate the trencher or run the engine in unventilated areas. Avoid coming in contact with the muffler and other engine parts after the engine is started. Temperature may exceed 150 degrees F (66.6 degrees C). Allow engine to cool before attempting to perform any maintenance. Using a "can opener" or "rocking" motion, push down on the handle bars 2 to 4 inches. At the same time, pull the trencher toward you 4 to 6 inches. Slowly allow the handlebars to raise until they stop. Repeat this motion throughout the trenching operation. The wheel lock will aid you in this operation by helping to hold the trencher in position until the next motion is started. With the engine running at an idle, push down on the handlebar, raising the digging bar. Move the depth-control lever forward until it locks in the first notch. The depth-control lever is located at the rear of the trencher. To operate, lift the lever until the "lock" is clear of the "notch" on the side plates. Slowly move the lever forward until the digging bar is at the first "notch." Insert the "lock" into the "notch" to set the digging depth. Notches are set at about 6, 8 and 12 inches. Increase the engine speed and lower the digging-bar, allowing it to dig to its depth; make sure you have control of the trencher during this process. If a deeper depth is required, slowly move the depth control lever forward until the desired depth is reached; maintain firm control of the trencher at all times. Set engine speed as required for best penetration. When trench is finished, shut the motor off. Refer to engine manual for correct procedure. Using depth control handle, raise digging bar out of the trench and lock it in the rear-most notch. Please follow this link for your operation and safety viedo by Vermeer.